Posted on March 25, 2019 Author Robert Cotto Jr.
Last Saturday, I* participated in former Hartford Councilman Luis E. Cotto’s** Budget Workshop entitled, Hartford City Hall 101, at the Hartford Public Library. The workshop featured an innovative “human library” approach where small groups rotated to ask questions of different experts for about 20 minutes. For this workshop, I discussed Hartford Public Schools budget and Carlos Rivera spoke about the Department of Health and Human Services budget. 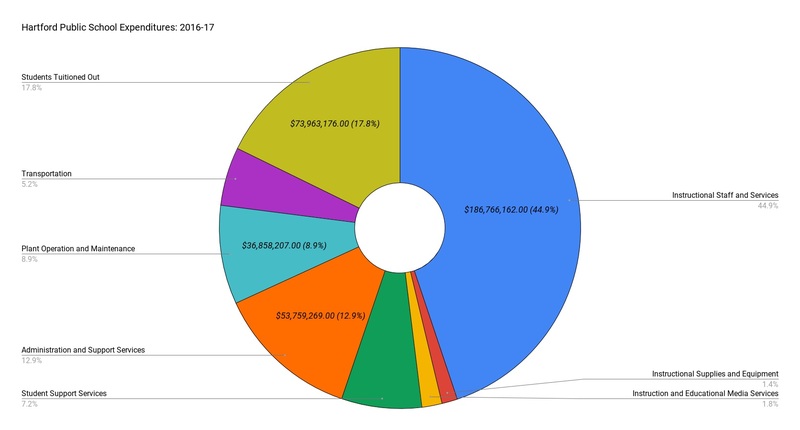 Regarding the HPS budget, I created two simple charts as an intro to discussion. You can see the questions and charts below. 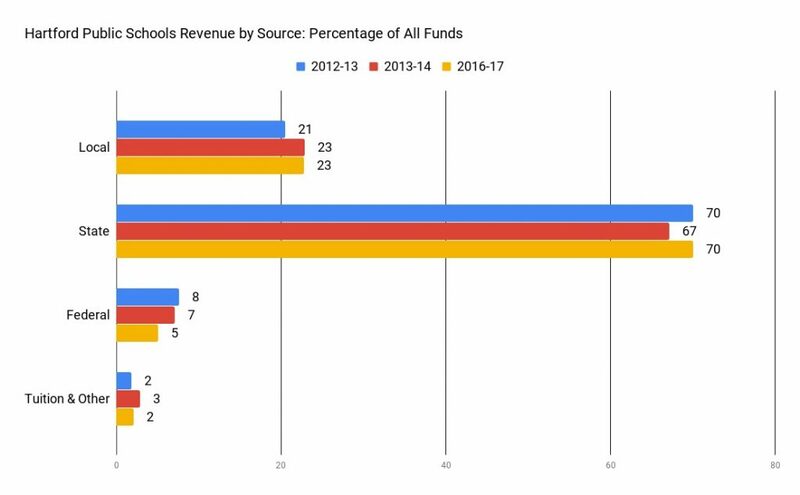 What are the sources of revenue for the Hartford Public Schools? 70% State funds (CT income taxes and other taxes fees), 23% local funds (city taxes, fees, etc. ), 5% federal funds. 2. In which categories does Hartford Public Schools spend its funds on? Largest categories are instructional staff and support (45%), student tuition to out placements, magnet, and charter schools (18%), and administration and support services (13%). Views expressed in this blog are those of the author and do not necessarily reflect the official policy or position of Trinity College. Does consolidating school districts save money and lead to greater efficiency? It’s not so simple. Posted on March 6, 2019 March 6, 2019 Author Robert Cotto Jr. Earlier this year, various proposed bills emerged at the Legislature that would require small public school districts to consolidate. While the bills have inspired a great deal of controversy, one key aspect has been left unexamined. In short, it has been simply assumed that consolidating small school districts will lead to greater efficiency and cost savings. The stated goal of these bills is to create more “efficiency” through district consolidation. In other words, instead of a number of small districts, these districts could merge and thus, in theory, find savings by cutting redundant positions or services and find economics of scale (e.g. think buying in bulk at Costco versus small units at CVS). So let’s summarize the proposed bills. With few other details, the first bill would require public school districts with fewer than 2,000 students to consolidate. Similarly, the second bill would require towns with fewer than 40,000 resident to consolidate public school districts associated with those towns. The final Governor’s bill would form a committee, commission some committee reports, and put together a plan for district consolidation. The bill includes some potential of incentives for districts to consolidate. The first two bills are somewhat more clear cut about which districts consolidate, while the third bill is less clear on that point but has more direction about a process. That’s a very short summary, but we can unpack more later. So would consolidating districts save money by reducing redundant services or creating greater efficiency? It seems like common sense. It might work in some cases and depending on the implementation. But it’s not as simple as it seems. Here are a few considerations. District size is only one measure in determining efficiency. When people conduct efficiency analyses, district size is only one measure of understanding costs. While it is true that rural districts tend to cost more on a per-pupil basis, that doesn’t mean the they are less efficient, per se (Baker, 2018). Scholars can do complex statistical analyses to understand whether one group of districts is more efficient in terms of cost and performance (Baker, 2018). Other measures include spending, district demographics and enrollment, academic achievement, town geographical characteristics, labor costs, and other variables. Consolidating districts can reshape labor markets in unintended ways. A concern of people that study consolidating school districts is that this reform could lead to unintended consequences in the labor market. Yet, in the public discussion, it is assumed that consolidating districts can lead to eliminating redundant positions or merging functions like a superintendent for example. But let’s think this through for a minute. Consolidate two districts into one and only one superintendent is needed, right? Here’s a problem. This move would change the labor market. The new superintendent might command a higher wage to oversee a larger district and might need more help to administer it. With regard to teachers, there are other issues to consider. Here’s an example. If three small, rural districts consolidate, there would be one larger employer and also three labor associations and agreements to consolidate. Which collective bargaining agreement would prevail? The more generous pay scale (average pay is $60K)? something in the middle (average pay is $50K)? The lowest (average pay is $40K)? Two of the bills mention collective bargaining, but don’t provide many details. In Massachusetts, a consolidation law requires that the most generous collectively bargained pay scale for teachers would prevail when districts merge (Cronin, 2010). So if that were the case in Connecticut, instead of three districts with varying pay scales, there could remain a much larger one with larger pay for all the teachers. A simulation of Illinois district consolidation predicted a similar issue of increase in teacher pay with consolidation of small public school districts (Heiney, 2012). These unintended results of changing the labor market would cut into potential savings of merging school districts. The incentives offered to districts to consolidate can be larger than cost savings from consolidation. The Governor’s bill and proposal includes potential incentives to districts that consolidate. Unanswered questions remain such as: What kind of incentives are we talking about? And how big? These details matter. Consolidating school districts, small or large, might lead to some degree of greater efficiency or cost savings. But in particularly small districts, these savings might be very small. It’s simple math. And if the incentives are large enough in terms of aid grants or capital improvement grants to small districts to consolidate, these could end up being larger than the money saved. Scholars found this issue in Iowa after consolidation of small school districts in the 1990s. Small districts took the incentives to consolidate, but they outweighed the cost savings. The ultimate result was that limited State funding was diverted from more needy school districts to rural school districts that did not need more funding (Gordon and Knight, 2008). These are some things to consider. There are tons of questions about these proposals and very few details. 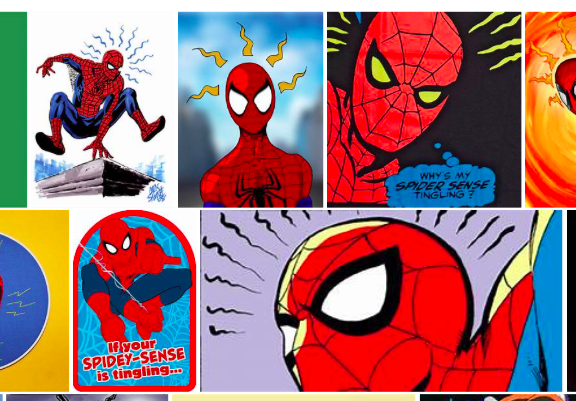 When I see bills like these without much detail and with limited analysis, it raises my Latino spider sense that something is seriously suspect. Baker, B. D. (2018). Educational Inequality and School Finance: Why Money Matters for America’s Students. Cambridge, MA: Harvard Education Press. Heiney, J. N. (2012). Can State & Local Government Consolidation Really Save Money. Journal of Business & Economics Research, 10(10), 539–546. Cronin, J. M. (2010). A Case Study of School District Consolidation. School Administrator, 67(5). Gordon, N., & Knight, B. (2008). The Effects of School District Consolidation on Educational Cost and Quality. Public Finance Review, 36(4), 408–430. Posted on November 17, 2018 November 17, 2018 Author Robert Cotto Jr. Here is a summary of steps I would take moving forward on school desegregation in CT. This is based on my reading of history and research in schools and communities now. These are some ideas of how we can build on the historic investment in racially diverse schools in Hartford, CT area prompted by the Sheff v. O’Neill case. This is not a retreat from pursuing racial diversity (numerical desegregation), but an addition and broadening of goals (qualitative integration). These are my own thoughts, not of any particular group or plaintiffs. • All Hartford schools will provide high-quality and effective education for its students. • All Hartford schools will have the resources that students need to be successful. • Understand the difference between numerical desegregation and qualitative integration. • Support positive racial development of Black, Latinx, & Asian students in desegregated schools. • Multicultural and multilingual education (e.g. ethnic studies, dual language programs). • Share accomplishments of quality and integration education (e.g. web, in-person, testimonies). • Every “Sheff” school should have a plaque and website explaining Sheff v. O’Neill history. • Confront and campaign against school segregation, privatization, and dispossession. Posted on November 13, 2018 November 13, 2018 Author Robert Cotto Jr. 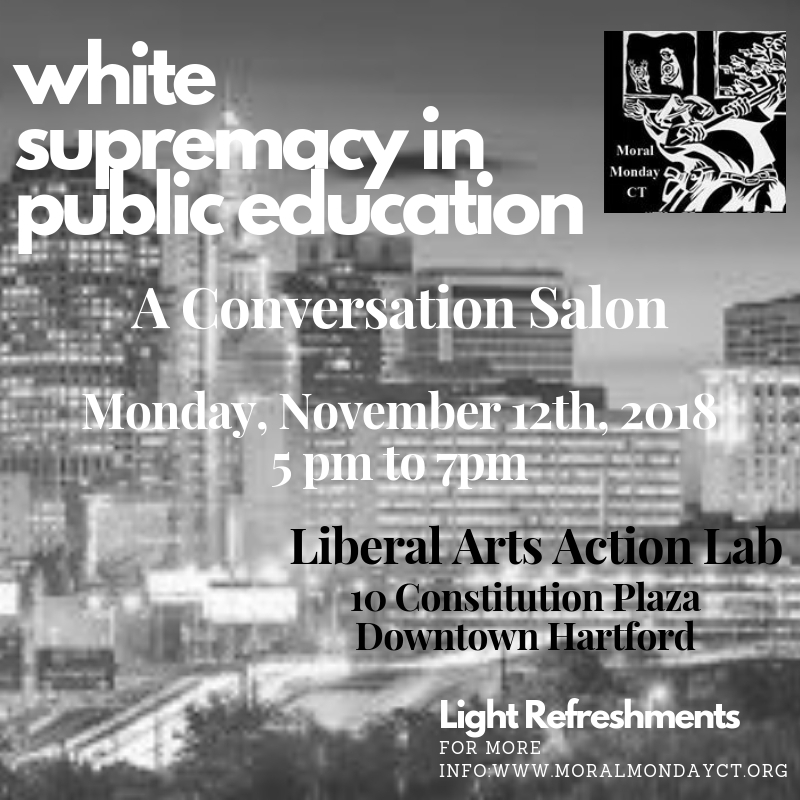 Yesterday, Moral Monday CT convened a discussion that examined the ideology of white supremacy in education at the Trinity College Liberal Arts Action Lab in downtown Hartford. Put simply, panelists and attendees critiqued the pervasive belief that white people are superior and should dominate all aspects of society. Panelists included Richard de Meij, a Hartford Public Schools teacher, Michelle McKnight, a Manchester Public Schools teacher, and me. The conversation with audience members ranged from racial segregation, lack of Black and Latina/o teachers, lack of culturally relevant curriculum and pedagogy for Black and Latino/a students, problems of educational testing and school choice, and a number of other areas. An especially spirited thread of the discussion focused on magnet schools in Hartford. As one of panelists, I led the audience through a very, very brief history of magnet schools in Hartford. I brought up the challenges faced by Black and Latino leaders in getting resources for Hartford students in the post-Civil Rights Movement era. As a possible way of thinking about this challenge, I brought up the idea of interest convergence (Bell, 1980), or the idea that Black and Brown progress in civil rights tends to happen when white interests are also served. Well into the 1980s, Hartford was largely on its own when it came to state politics and school funding. Magnets were seen as way to bring white, black, and Puerto Rican interests together across city-town lines, confronting racial isolation of white students as much or more as Black and Puerto Rican students. Magnet had the potential to break the political divisions sustained by town-city lines. When we got to the open discussion, that’s when things got interesting. Joining our discussion was one of the plaintiffs in the Robinson v. Wentzell case seeking to undue the “race-conscious” magnet system as currently designed. The leadership plaintiff Ms. LaShawn Robinson asked me, “why do you like magnet schools so much? And what would you do if you kid didn’t get into a magnet school?” I only had time to answer the first question, but here was my response as best as I remember it! First, I clarified that I don’t believe that magnet schools as the only way of delivering equal educational opportunity. But I see magnets as an important tool from a historical lens. Second, the people that thought to make magnet schools believed that kids of difference races would one day work together and they thought schools would be the place to practice racial integration. I admitted that this might seem a bit “polly-ann-ish,” but it was also the 60s. In other words, magnet schools in Hartford began at a time when people arguably had more hope for this country than they might do now. Third, by bringing together kids from different towns and cities, magnets can be a tool for bringing white, black, Latino, and Asian interests together. If you believe in the permanence of racism as current Critical Race Theorists and many past leaders of color did, then you view little reason for whites do anything for Black and Latinas/os for greater educational opportunity beyond their own self-interests. Indeed, whites (and some people of color) in the suburbs can go to their well-resourced and responsive schools, in their neighborhoods, and go to their jobs, then look over at city neighborhoods and underresourced and culturally irrelevant schools as “dysfunctional” or “low-performing” without having to question how things got to be the way they are. As other scholars have noted such Gary Orfield (2013), racial segregation in housing and schools sustains these beliefs of white superiority and limits any interest in doing much about racial inequality. Finally, I explained that there is nothing stopping the State of Connecticut from making non-magnet schools well-funded, fantastic places for kids and adults to learn and grow. There’s nothing stopping the State from making public schools more culturally relevant and responsive places to kids of color. If the State wants to make all schools fantastic, well-funded, and responsive to people of color, then do it! The Sheff plaintiffs aren’t stopping the State from improve all schools in the cities. But the State simply won’t do more than the bare minimum as evidenced in the recent Supreme Court decision in the CCJEF case. In addition, recent school reforms such as school turnarounds, “Alliance” District funding, and Common Core have fallen flat. And right now, the current leadership wants to expand privately-managed, publicly-funded, also hyper-segregated charter schools rather than racially-diverse, magnet public schools. To close the discussion, I raised the question of what will make white people, including the State, interested in Black and Latino progress in schools? If it’s not magnet schools under Sheff v. O’Neill school desegregation, then what? If it’s not a lawsuit like the CCJEF school funding case, then what? Right now, the hot, monied interest is in school privatization through charter schools that takes money away from the public school system and even diverts money from charter school students through fees to management companies. I wondered whether there was an over-emphasis on just changing “hearts and minds”, which may be necessary, but not sufficient for change. What protest, political force, direct action, or legal challenge will force the State and white people in the suburbs and cities into doing anything than the bare minimum offered to many urban schools today? Notes: The event was organized by Moral Monday CT which is led by Pamela Moore Selders and Bishop John Selders. Jesse Turner, CCSU Professor, also contributed to organization of the event. I’m sorry if I missed other collaborators! Thanks to Moral Monday CT for the forum. Thanks to the audience for sharing their stories and ideas. This Saturday, 11/17/18, the Sheff Movement will host a conversation on school desegregation entitled, “Integration Matters.” The panel and discussion starts at 10 a.m. and goes until noon. Join us at the 75 Charter Oak Avenue. RSVP here because space is limited. Posted on October 30, 2018 October 30, 2018 Author Robert Cotto Jr.